Lai, Y. and Huang, Y. (2017). 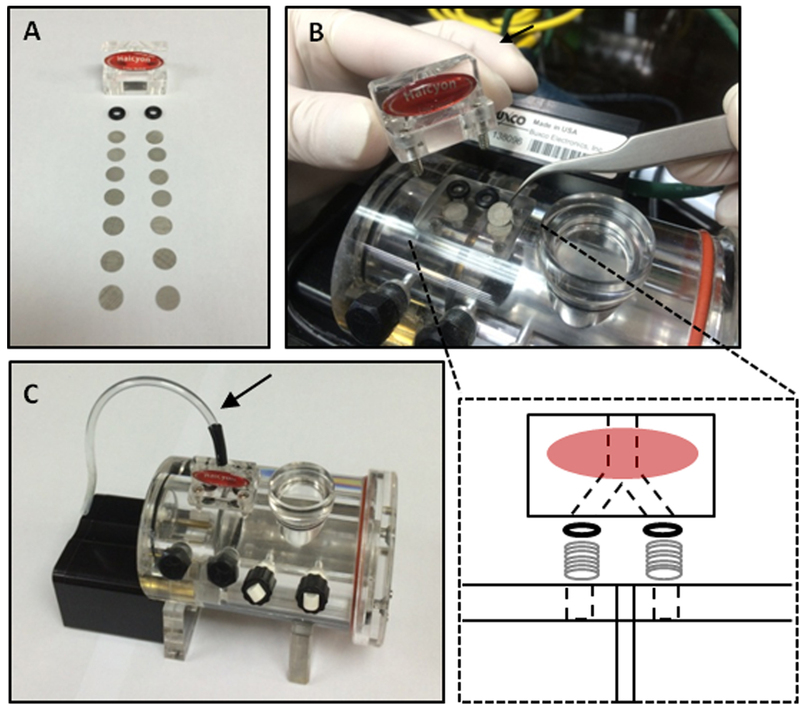 Modification and Application of a Commercial Whole-body Plethysmograph to Monitor Respiratory Abnormalities in Neonatal Mice. Bio-protocol 7(12): e2343. DOI: 10.21769/BioProtoc.2343. Lai, Y. T., Su, C. K., Jiang, S. T., Chang, Y. J., Lai, A. C. and Huang, Y. S. (2016). Deficiency of CPEB2-confined choline acetyltransferase expression in the dorsal motor nucleus of vagus causes hyperactivated parasympathetic signaling-associated bronchoconstriction. J Neurosci 36(50): 12661-12676. Proper breathing is essential for mammals to acquire oxygen after birth and requires coordinated actions among several tissues, including diaphragm, intercostal muscles, trachea, bronchi, lung and respiration-regulating neurons located in the medulla oblongata. Genetically modified mice that die early postnatally may have respiratory defects caused by maldevelopment of any one of these tissues (Turgeon and Meloche, 2009). Because of the small body size of neonatal pups, whole-body plethysmography can be used to monitor their respiratory activities. In this protocol, we modified the commercial whole-body plethysmograph by increasing metal filters in the pneumotach, connecting an extension tube to the pneumotach and removing the bias flow supply. With these modifications, the sensitivity of this device is significantly increased to enable the detection of rhythmic respiration in neonatal mice as early as postnatal day 1 (P1). 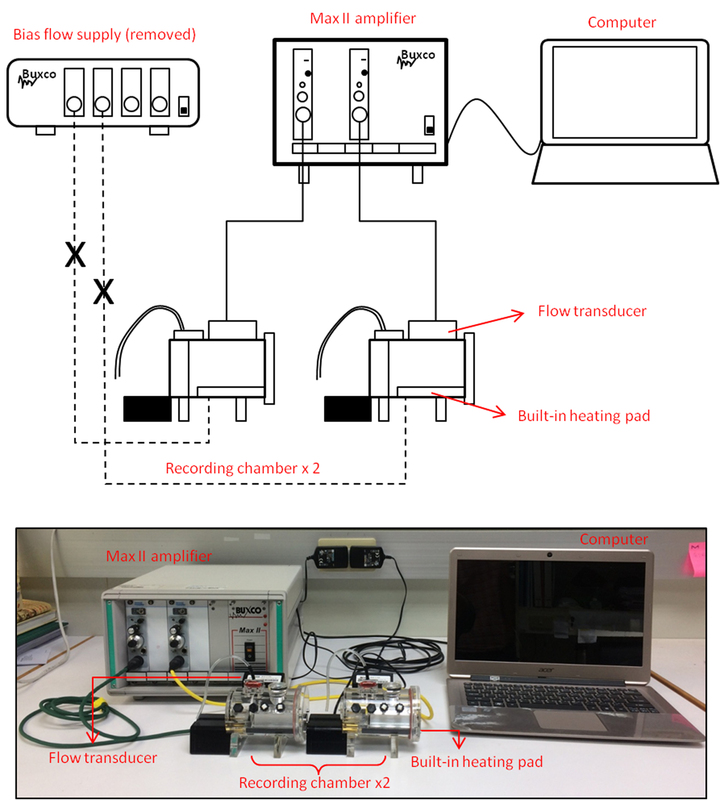 Several labs have used home-made or custom-built plethysmograph devices to identify respiratory failure in genetically modified neonatal mice (Nsegbe et al., 2004; Crone et al., 2012). However, for researchers who are novices in this field and want to investigate the cause of neonatal lethality in mice, a commercial whole-body plethysmograph (WBP, Buxco system, DSI) is a reasonable choice. When we first set up this system to monitor respirations of P0 mice, the respiratory activities in C57BL/6 newborns were most of the time undetectable until mice reached 3 days old. Because the WBP measures the pressure changes within the animal chamber that are due to inspired air humidified and heated by an animal’s lung during breathing, increasing the detection sensitivity of this device was the only way to monitor respiration of C57BL/6 neonates before P3. In this protocol, we share our experience in modifying this system to reliably detect rhythmic respiration in C57BL/6 neonatal pups as early as P1 and possibly P0. Once the recorded traces are obtained, several parameters calculated by the FinePointe software are useful for exploring respiratory abnormalities in mice who do not die of cyanosis due to severe respiratory failure right after birth (Lai et al., 2016). To enhance detection sensitivity, we disassembled the Halcyon pneumotach and increased the number of metal filters from 4 to 7 in both channels of the pneumotach individually connected to animal and reference chambers (Figures 2A and 2B). By doing so, we increased the differential pressure change caused by subtle neonatal respiration. However, this modification also changed the values of some respiratory parameters (Figure 6). Although we contacted Buxco technical services before and after solving the sensitivity problem, we were unable to get any help to properly adjust the instrument settings to maintain the original values. The aforementioned change increases the detection sensitivity and also the background signal from the Buxco bias flow pump that is usually used with the plethysmograph, so the bias flow supply has to be removed to reduce the noise from the air supply. We connected a bended extension tube to the Halcyon pneumotach to avoid any disturbed airflow from the upper environment such as the user’s breath (Figure 2C). Figure 2. Modification of the Halcyon pneumotach and recording chamber. A. The number of metal filters in both pneumotach channels was increased to 7. B. Loading metal filters in the Halcyon pneumotach; C. The modified pneumotach assembled onto the recording chamber was connected with an extension tube (arrow) facing downward to avoid any airflow disturbance. Transfer the P0 C57BL/6 litter to an ICR foster dam for care until recording. Incubate a cup of water in an oven at 34 ± 1 °C for humidification. Retrieve all P1 pups and keep them warm in the humidified oven for at least 20 min before plethysmographic recording. 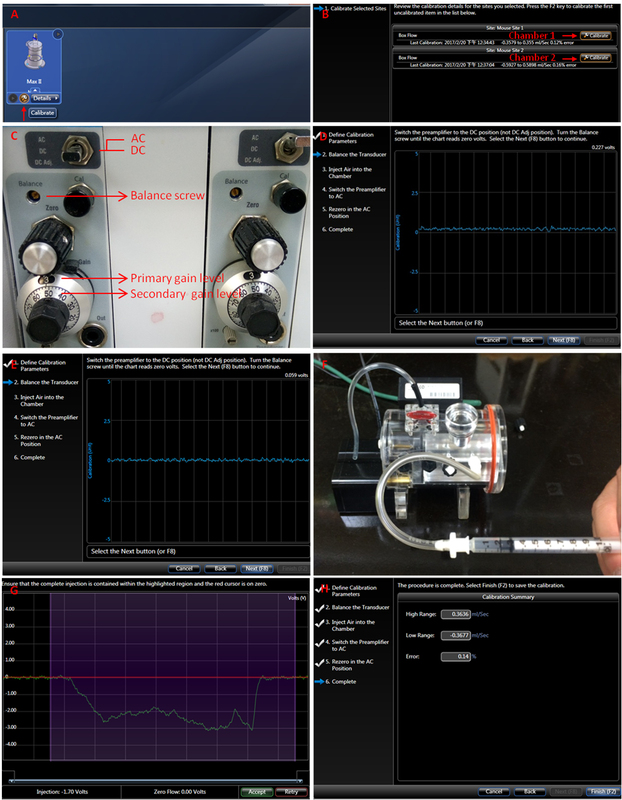 Calibrate the device by following the instructions in the FinePointe wizard (Figure 3). Click the calibrate icon (Figure 3A). Figure 3. Calibration of the chamber. A-H. Follow the instructions in the FinePointe wizard, including zeroing the amplifier, balancing the transducer and injecting air into the chamber. Click the wrench icon to calibrate each chamber (Figure 3B). Set the gain level to 3.5 (Figure 3C). Switch the amplifier to the direct current position (DC). Turn the balance screw until the chart reads 0 volt (Figures 3D and 3E). Inject 200 μl air into the chamber (Figure 3F). Ensure the injected airflow is completely contained within the highlighted purple region and that the red cursor is on 0 (Figure 3G). Switch the amplifier to the alternating current position (AC) position and push the ‘next’ button for re-zeroing. Click the ‘finish’ button to complete the calibration (Figure 3H). Place a P1 pup in the animal chamber gently. Close the chamber and let the pup habituate for 1 min. Start the measurement. Record each pup for three 3-min sessions. To avoid the accumulation of CO2 and humidity in the absence of bias flow air supply, open the chamber at the end of each session for 1 min. Remove the pup from the animal chamber. 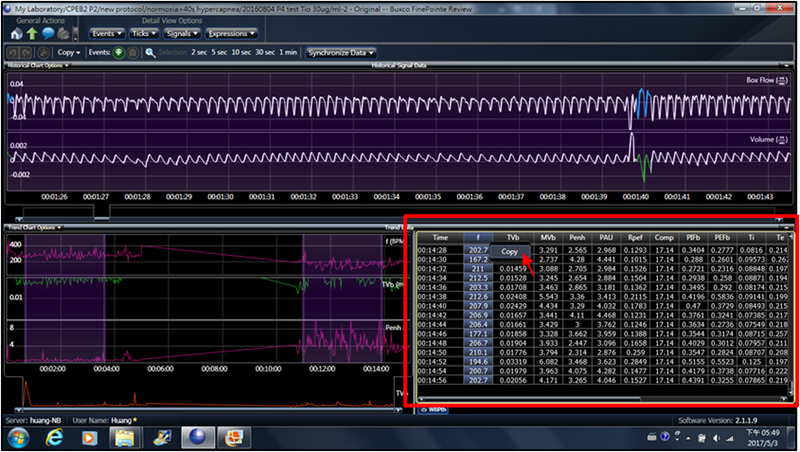 Save the recording traces (Figure 4) and proceed to data analysis (Figure 5). Figure 4. Representative breathing traces from P0, P1 and P3 neonatal mice. A and B. Respiratory flow of P3 mice by using the original and modified recording chamber. C and D. Respiratory flow of P0 mice by using the original and modified recording chamber. Arrows indicate the inspiratory peaks with peak flow which is > 0.01 ml/sec. E. Respiratory flow of P1 CPEB2-knockout mice by using the modified recording chamber. Bracket indicates the apnea. Because breathing movements are measured noninvasively in non-anesthetized pups, only signals recorded from the pup at resting state are analyzed. However, FinePointe software (Buxco system, DSI) calculates all rhythmic signals, including those generated from body movements or respiration during movement. Thus, to analyze real signals from resting respiration, we selected the raw data for all respiratory parameters from the table (Figure 5, arrow) and copied and pasted them into an Excel spreadsheet. We also closely observed and marked the times when the pup was not at rest during plethysmographic recording to manually exclude these problematic data points due to body movement. Only the data from resting respiratory activities were averaged to derive respiratory frequency, tidal volume, inspiratory time, expiratory time, peak inspiratory flow and peak expiratory flow. Respiratory frequency of P0 mice was manually analyzed by counting the number of inspiratory peaks with peak flow > 0.01 ml/sec (Figure 4D, arrows). An apneic episode is defined when a ventilatory pause is twice longer than the preceding breath duration (Figure 4E), which is scored manually for the occurring number per minute and duration. Figure 5. Extracted raw data for all respiratory parameters from the trend data table. Selected data points were copied and pasted into an Excel spreadsheet. If the genetically modified mice do not die immediately after birth, we suggest transferring pups to an ICR dam for 18-24 h until measurement because C57BL/6 dams have poor maternal instincts and may not rear pups with respiratory deficiencies. In our modified WBP, P1 mice show more rhythmic and stronger respiratory movements than P0 mice, so analyzing respiratory parameters from their recording traces is more reliable. Due to subtle respiratory signals of P0 mice, we only analyze the respiratory frequency by manually counting the number of inspiratory peaks > 0.01 ml/sec (Figure 4D, arrows). The values of tidal volume, peak inspiratory flow (PIF) and peak expiratory flow (PEF) are amplified by using the modified WBP, so they are compared between the control and experimental groups. 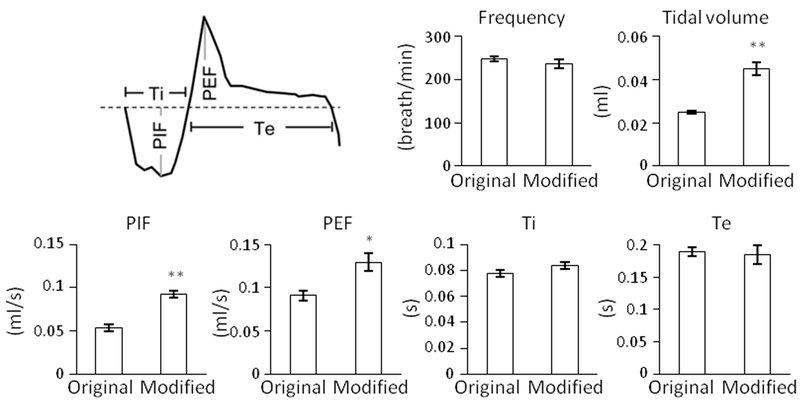 In contrast, the values of respiratory frequency, inspiratory time (Ti) and expiratory time (Te) are unaffected (Figure 6). Figure 6. Comparison of respiratory parameters recorded in mice at P3 by using the original and modified recording chambers. Ti, inspiratory time; Te, expiratory time; PIF, peak inspiratory flow; PEF, peak expiratory flow. Data are mean ± SEM (n = 3). *P < 0.05, **P < 0.01, Student’s t-test. Lights are on from 8 AM to 8 PM in our mouse room. We usually perform the respiratory recording between 10 AM to 5 PM. In our experience, neonatal mice appeared more active when recording was performed after 5 PM, likely due to the circadian rhythm. This work was supported by the Ministry of Science and Technology (Most 105-2321-B-001-044) in Taiwan. 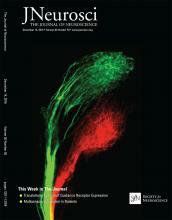 Crone, S. A., Viemari, J. C., Droho, S., Mrejeru, A., Ramirez, J. M. and Sharma, K. (2012). Irregular breathing in mice following genetic ablation of V2a neurons. J Neurosci 32(23): 7895-7906. Nsegbe, E., Wallen-Mackenzie, A., Dauger, S., Roux, J. C., Shvarev, Y., Lagercrantz, H., Perlmann, T. and Herlenius, E. (2004). Congenital hypoventilation and impaired hypoxic response in Nurr1 mutant mice. J Physiol 556(Pt 1): 43-59. Turgeon, B. and Meloche, S. (2009). Interpreting neonatal lethal phenotypes in mouse mutants: insights into gene function and human diseases. Physiol Rev 89(1): 1-26.